Have you ever looked down and wondered what in the world was happening in your soil? Who was eating who? How many varieties of bacteria, fungi, arthropods, algae, etc. were down there? I didn't give it much thought, either... but after reading Teaming with Microbes, I have a new appreciation for the incredible complexity of nature. Ever heard the organic gardening advice "feed the soil, not the plant?" Around the roots of your vegetables, shrubs and trees, there's a vast web of microorganisms living sometimes in competition, sometimes in cooperation, and sometimes in symbiosis. Fungal nets stretch out from the roots of a pine to capture nutrients the tree cannot... bacteria create feeding frenzies that heat up a pile of grass clippings... mushrooms spring from the wood they're breaking down into compost... tiny mites and nematodes constantly turn the soil and release nutrition... it's a wild world. Lowenfels and Lewis encourage you to harness that world on behalf of your plants. If you're the type of person that gets bored by science, I should say that you won't like the first part of this book... but instead, I'm going to say you're a moron. Science is awesome. One part of Teaming with Microbes I found particularly interesting was the difference between plant communities and how some prefer bacterially dominated soils... and other prefer fungally dominated soils. It makes sense when you consider the difference between an annual vegetable garden with its constant plant turnover and the relative stability of a forest. The former is a live-fast-die-young place where bacteria reign... the latter is a place where vast nets of mycellium invest themselves into unturned soil. 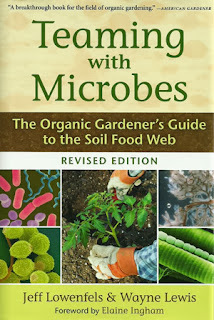 And speaking of soil turning, one of the takeaways the authors want you to get from this book is: DON'T TILL! This is emphasized multiple times through the text. Though I don't buy completely into the "no till" approach, I do understand the reasoning behind that philosophy better after reading Teaming with Microbes. Overall, the information in this book is eye-opening and consistently entertaining. I found myself wanting to go deeper after reading, which is one of my criteria for a good book. It left me daydreaming of ways to bring more life into my soil, particularly in my compacted and sad front yard. Teaming with Microbes is a very good book. You can pick up a copy here. Nice. I'm getting my reading list together for 2014, and this is on the list. I have been trying to keep the veggie garden bacterially dominant, but it is a pain to constantly make compost tea. One thing I do is to take advantage of habits. For example, I make a protein smoothie every morning for breakfast. It usually has a some high-quality dairy (goat milk, greek yogurt, etc...) a couple eggs, some protein powder, frozen fruit and whatnot. When I'm done, all the leftover stuff in the blender is recombined with the eggshells and other food scraps, pulverized, and mixed with water to pour in garden soil. I figure that's pretty good bacteria fodder. And whenever I have sour milk or bad cheese, it goes in the compost heap. When I take a pitchfork and open the top, I can literally see steam coming up. This one's on my reading list, too. Thanks for the review! I tend to do soil drenches a lot because my main introduced nitrogen source is urine, which I have to dilute anyway. My "usual mix" is 1/2 gallon of urine, a couple ounces of fish emulsion, a 1/4 c or so of bone meal, and then enough rain water to fill a 10 gallon bucket. It means lugging a lot of full buckets around the yard but that's just extra exercise as far as I'm concerned. And thank you for updating the comment widget! I think yogurt is great bacteria fodder. Grains are good for fungi, too, like old bread and oatmeal. I like pulverizing things in the blender. I should probably get another blender just for that sort of thing. I love this book. Unbelievable content, learned how to build a compost pile and restore a dead, garbage-filled, asphalt-filled piece of land into a beautiful, bacterial, bug filled piece of land that is getting notice from my City Councilmen. We may even have city grants coming our way for building a community garden, all of which came from reading this book and applying its principles. This is written in such a way that the average gardener can understand the fairly recent scientific research discoveries regarding the world of activity taking place in their soil. This explains why some things that were considered good gardening practices in the past actually inhibit the natural processes of healthy plant growth. Understanding the biology of the soil, you can implement low/no cost processes to greatly improve the life of it. A Victory for Food Growing Freedom!